Today was supposed to be a short ride of 73 miles. It started well and we left town onto an A road, but started to have cars and lorries beeping us and we realised that bikes weren't allowed so we had to leave the road and work out a new route. 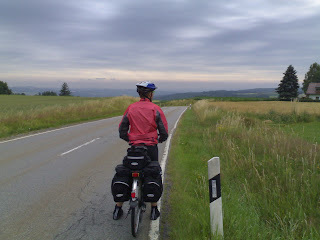 It meant a diversion over some pretty substantial hills, which really take it out of you. James was also slowed down by sore tendons above his knees (the same problem I had least year, when I ended up straining my leg), added to that we were cycling into the wind most of the day which makes everything very hard work and slowed us down. The downhill after the hills made it almost worthwhile. The rain started so we stopped for wild boar and dumplings for lunch in a wonderful old bar. It was still raining, but we had to head off and had another diversion to avoid the dreaded Autostrada and I had a puncture. As the day wore on we were really starting to feel the exertion of the morning's hills and the last 15 miles were very hard, plus it took ages to find the hotel. Landshut itself seemed rather dreary and we didn't bother going out. But we ate really well (Wiener Schnitzel and potato, plus beer) and they were very friendly.